Knurled metal handle version of QL. Combination of preset and adjustable type wrench. Dual square drives for clockwise and counter clockwise tightening. Piping for the water and gas, and building construction. Interchangeable head type for multi-purpose use. Knurled metal handle version of CL. 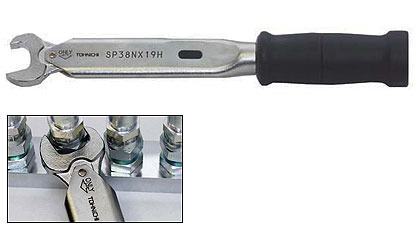 Combination of preset and adjustable type wrench with interchangeable heads. Preventing the possibility of over torque. Converts basic hand tools into torque wrenches. Super light weight Titanium torque wrench. Reduces worker fatigue. Insulated for safety. Ideal for electric auto assembly. Torque wrench for single purpose bolt tightening. Interchangeable head and preset type torque wrench. Click type torque wrench effective for both left and right threaded bolts. Open ratchet torque wrench for piping work. Standard preset type open spanner wrench for tightening in assembly lines. Preset torque and single purpose feature. Notched Head type preset torque wrench for brake flare nut tightening. "Slip" type preset torque wrench to completely eliminate the possibility of over-torque. Missed tightening can be eliminated with limit switch. Wireless "Error Proofing" torque system with universal 2.4GHz frequency band. Missed tightening can be visually confirmed. Missed tightening prevention with marking verification. Snug torque and angle can simply be set with the scale. It can be used for tightening in assembly linesand is suitable for inspection purpose (re-tightening inspection and loosening torque inspection). It is used for tightening inspection (one-way communication) and for assembly use (bi-directional communication). Wirelessly transmits the very torque value of tightening completion (torque value available on the wrench). Wirelessly transmits the very torque value of tightening completion (no torque display). For assembly process in sub lines and cell production and for Semi-automatic pneumatic torque wrench AC is upgraded with wireless data transmitting function. Ideal for tightening and quality inspectionsand for bolt tightening or re tightening inspection. Multi-function inspection torque wrench to process data including tightening parts/bolt qty/torque for total management. Anyone can easily identify the tightened torque at that time. Basic dial indicating inspection torque wrench with high accuracy. Dial-indicating torque wrench with interchangeable head. Dual grip dial indicating type torque wrench used to transfer stable torque to bolts, for both tightening and measuring. Direct reading type for tightening and measuring. Beam type torque wrenches for high torque range. For efficient bolt tightening operations even in confined places by ratchet function.